What grief around the lifeless body of Christ – a body replete with bleeding wounds, only covered by a thin loincloth across which blood is trickling down. The mother clings to the arm of her son, as if she wants to comfort him but at the same moment realizes that this is not possible anymore. Her soft-pink hand on his ink-white arm emphasizes the difference between life and death. She has wrinkles in her forehead and dark eyes from which all color has retreated, her whole being filled with sorrow. Someone behind her does not want to, cannot believe what has happened. He has raised his hand to ward off the raw reality, not yet ready to accept the unbelievable truth. The Father holds his Son, supporting his dead body and showing it to us: “Look, my beloved Son has died.” He does not look at us, his gaze is directed towards Jesus. Small angels have gathered around them. They also uphold Jesus’ body, wanting to do something, wanting to help. Other angels stand aghast – this cannot have happened. Maelwael’s quality as a painter show up well in this so-called ‘tondo’ (round painting) – see for instance the special dedication to a lifelike anatomy and the subtle nuances of color. The tondo shows us sorrow in various guises and is very moving in its human quality. The title Pietà means compassion and refers to the theme in art in which a mourning Mary, alone or together with John the Evangelist, is portrayed with Christ’s body. A Pietà is intended to intensify devotion. It is the more devotional version of the Lamentation, the scene following the Deposition in which Christ’s body is surrounded by grieving followers. This subject was often used for various forms of private devotion. It makes an appeal to the believer to ponder and sympathize with the suffering of Christ. This specific painting by Johan Maelwael (ca 1370-1415) is exceptional in that it also portrays God the Father, as a venerable old man with a long grey beard, together with a dove – the symbol of the Holy Spirit. In combination with the body of Christ the three figures form the Holy Trinity. This rare combination can probably be explained by who commissioned the work, the Burgundian Duke Philip the Bold. At the end of the 14th century he started with a full-scale building program in Dijon to give form to his dynastic ambitions. Among other buildings he commissioned a church where his family members could be buried, which we still know by the name Chartreuse de Champmol. This church was dedicated to the Holy Trinity. Maelwael was able to connect the themes his patron favored in a convincing manner. From 1397 onwards he served the duke. He was not only appointed as painter, but also as supervisor of the Chartreuse building program. He came from Nijmegen in the Netherlands. It was thanks to his valued work for the courts of the courts of Guelders (a duchy of the Holy Roman Empire) and France that he had obtained this important position in Dijon, where he was given so much influence that he could bring about that a number of his nephews from Nijmegen were also set to work in France. This were the brothers Paul, Johan and Herman of Limbourg. With their painted miniatures in famous manuscripts like the Très Riches Heures de Duc de Berry they managed to surpass their uncle in fame. Today Maelwael is only known in art-historical circles. Even so he is considered one of the patriarchs of Netherlandish (and Dutch) painting. His ancestors were painters as well: his father Willem as well as his uncle Herman worked for the Duke of Guelders. The name ‘Maelwael’ comes from ‘wel malen’ or painting well. It was accorded him due to his talent. While Willem and Herman were mostly heraldic painters of banners and shields, Johan acquired fame abroad. He became so well-known there that he was considered a Frenchman, going by the name of Jean Malouel. 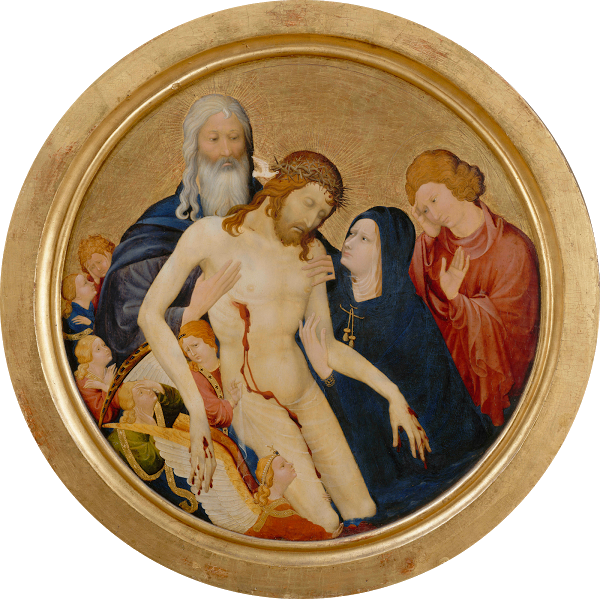 Johan Maelwael: The Large Round Pietà, c 1400, oil on panel, 64,5 x 64,5 cm, Louvre, Paris. Johan Maelwael (also known as Jan or Jean Maluel or Malouel, Guelders ca 1370 – Dijon 1415) was an Early Netherlandish painter, who mainly worked in France. Around 1400 he worked as a heraldic painter at the court of Guelders. Then he became court painter for the French queen and confidant of the Dukes Philip the Bold and John the Fearless. He introduced his nephews, the three Limbourg Brothers, to the French and Burgundian courts and functioned as their advisor. Thea Willemsen studied art history at the University of Amsterdam. She lectures at several open universities and art-historical institutes and organizes excursions.